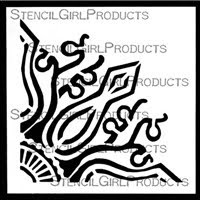 Take your artwork to lush places with the 10 versatile stencils Gwen Lafleur designed as her Decorative Elements Series. 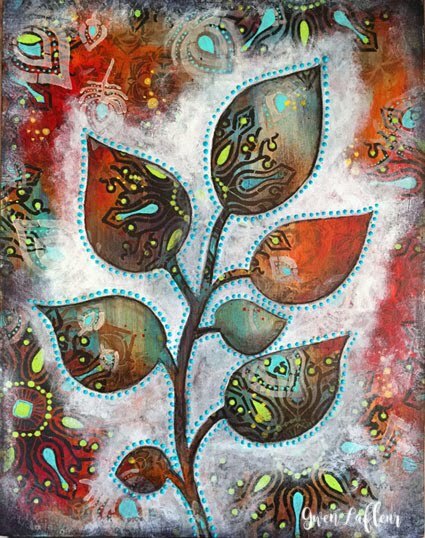 "Not Carmen Miranda specifically... this piece came out pretty organically. Because I'd used someone else's illustration (from an Uppercase publication), I wanted to make it mine. 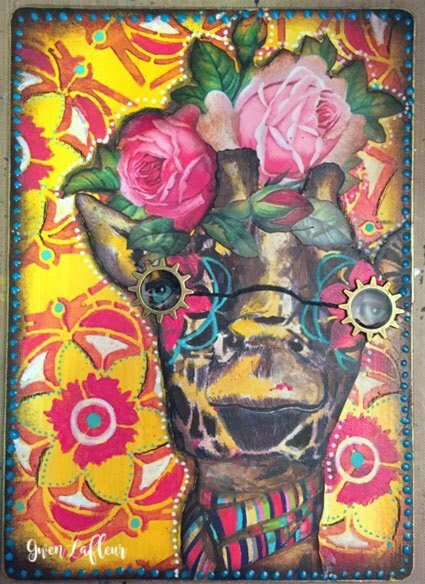 I started out by painting over it, then I glanced at some flower print-outs that were sitting on my desk and thought it would make a fun contrast to have a giraffe with a crown of flowers. Then I thought it would be cool to put something around its eyes and decided to use a stencil and color it in. Then I just happened to be looking for something else and found those gears and it was a lightening bolt moment where I thought it would be super cool and a bit steampunky. So at the beginning, there was no plan for any of it, but I love how it came out!" 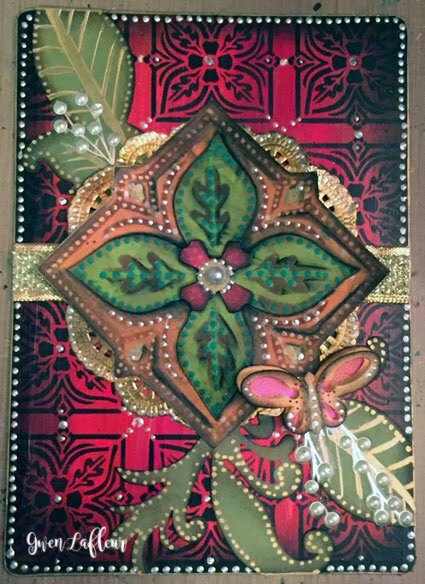 The art card above is all done in layers of paper. 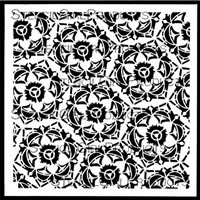 Gwen painted the background and stenciled over it, then with the 4x4 Folk Art Flower stencil, she stenciled it several times on different sheets of paper and cut them out and layered them to get the colored flower. Then she added the other collage layers as she built it up on the background. 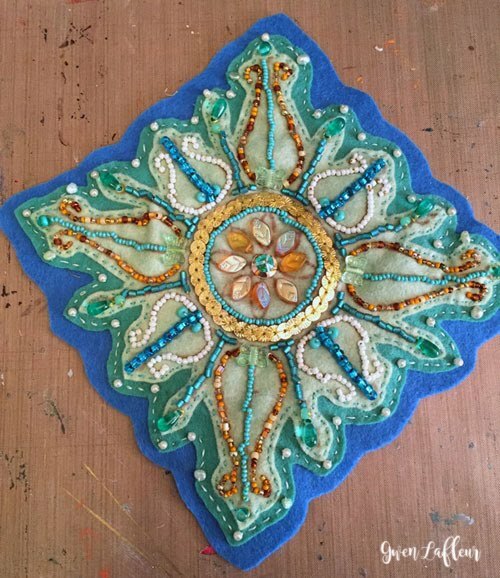 Gwen made a video so you can share in her excitement about her quarter repeat designs! 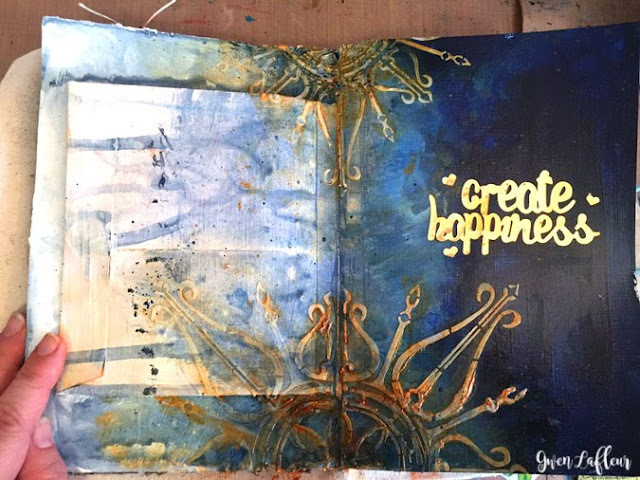 What are you yearning to create? 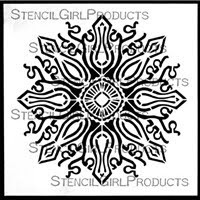 Gwen used this next stencil to embroider a piece that will probably become part of an iPad cover. 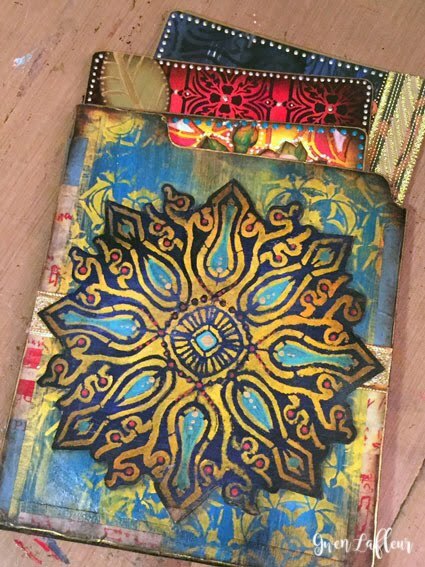 Gwen made a gorgeous repoussé and journal spread with this last stencil in her Decorative Series, but we'll share more about it and some layering tips with you in the May edition of the StencilGirl Scoop! 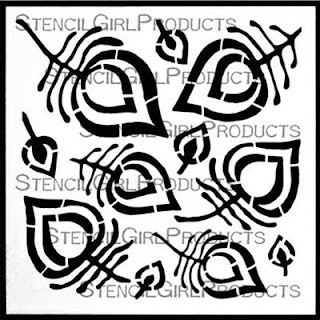 The 11th stencil by Gwen that StencilGirl is releasing, Peacock Feathers, is a stylized, hand-drawn one, and a companion to her Ornamental Peacock Mask. 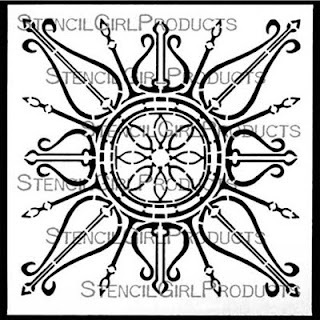 Gwen also used S387 and S388 in the artwork pictured below. She says, "Originally I was just building layers in the background knowing that I was going to do that reverse painting thing on top. In the end they end up working like leaves within the composition because the focal point kind of drives what you think you're seeing." 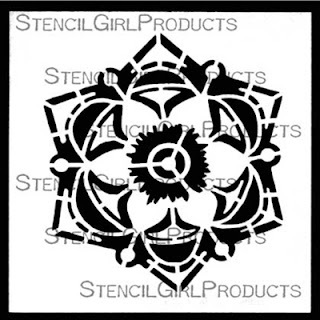 We hope you are as excited to use these stencils as we are to release them! You can find out more about Gwen on her website. 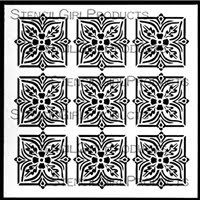 You can find all of Gwen's newest releases on our website. These are awesome! Want them all! 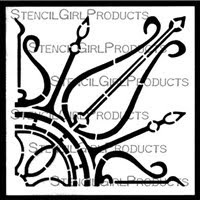 Gwen, these stencils and artworks are dazzling! 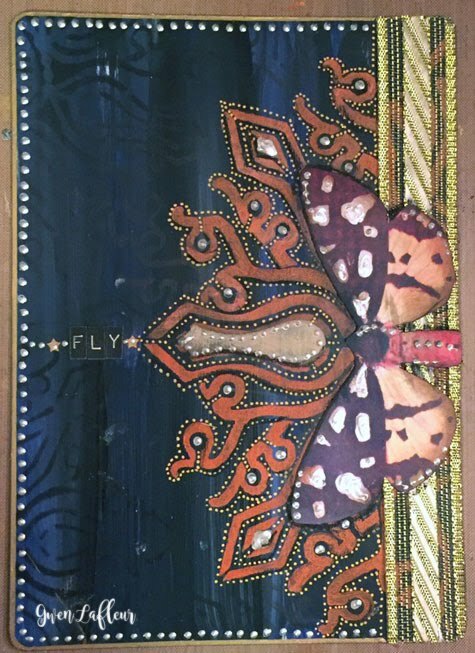 My favorite artwork of yours today is "Fly" -- what you've done here is totally outstanding! I. Want. Them. All!! Absolutely gorgeous! 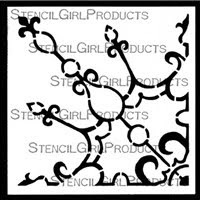 These are really great stencils...I love the versatility of the corner stencils...so many possibilities.!!!! Gotta get me some!!! Thanks Monica! 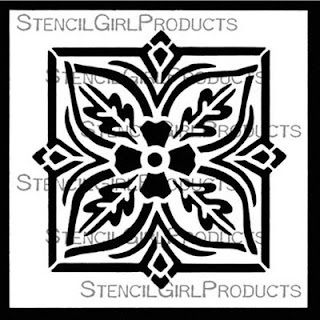 I'm really excited about the corner stencils - so glad to hear that you are as well! I'm blown away, Gwen. 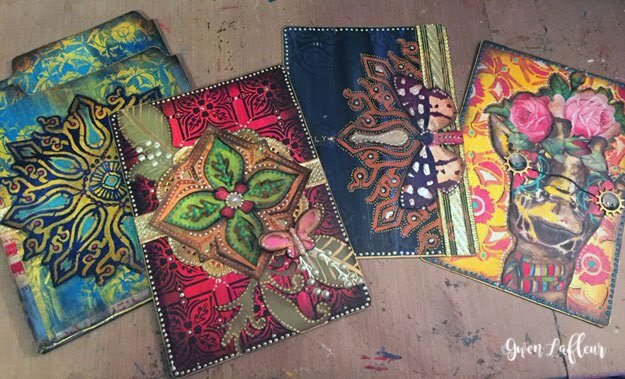 Your art and now those stencils... just beautiful. Thanks so much Jill! Great to spend the day with you on Saturday! lol, thanks! I don't know why I didn't think of it sooner... it makes total sense, I think!